Discover SCS Cluster worldwilde partners network , as well as european projects wherein SCS cluster shares his expertise and promotes his members expertise as a Digital Innovation Hub. The Industrial Internet Consortium is the world’s leading organization transforming business and society by accelerating the Industrial Internet of Things (IIoT). Our mission is to deliver a trustworthy IIoT in which the world’s systems and devices are securely connected and controlled to deliver transformational outcomes. 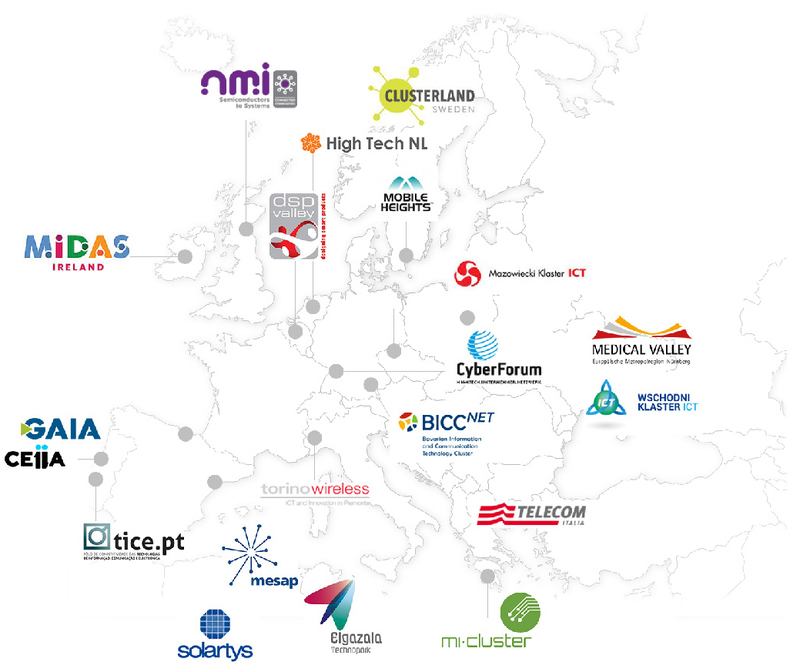 Silicon Europe Alliance gathers leading European Clusters in all fields of the electronics and semiconductor. SCS cluster is involved in the CLUSGRID project – Clusters for Smart Grids, funded under the COSME Cluster Excellence programme of the European Commission. This project aims at improving management of the clusters of the consortium to provide better services to their SMEs in the smart grids value chain. This project benefits to SCS cluster’s SMEs through the improvements of its own services offered to its members especially in terms of internationalisation but also through the connection opportunities with other clusters’ ecosystems in ICT and efficient energy. Coordinator : East Development Agency Co.
SCS Cluster is coordinator of DIA – European Digital Industry Alliance project. The main objective of the project is to build-up a partnership of world leading clusters to configure a “European Strategic Cluster Partnership – Going International” focused on internationalization of digital technologies applied to manufacturing and industry (also called “Industry 4.0”). This European Strategic Cluster Partnership (ESCP-4i) will lead clusters to increase their competitiveness and innovation potential for internationalization with a European coherence, fostering international cooperation among SMEs, and enhance innovation. The global value chain will be structured around an innovative transnational collaborative approach focused on cross-sectoral collaboration to commercialize the different technologies, product and services jointly in the field of digital technologies applied to manufacturing and industry developed by the clusters (and their SMEs) in international markets that will be identified in the project. The project will provide a better understanding of the most effective ways to improvecross-sectoral collaboration between clusters at a European interregional level in order todevelop and commercialize frontline innovations internationally. Besides, although focused on digital technology in the manufacturing field, the universality of the method will allow developing other global value chain with other regions and in other technology domains, a very useful approach to build-up regional smart specialization strategies. The purpose of this project is to foster cross-sectoral cooperation between the European clusters in the partnership and their SME members, as well as to support their SME members in going international and positioning them in the advanced smart packaging global value chain. This will be done through the establishment of an ESCP formed by 6 European clusters which bring together different competencies to apply a cross-sectoral approach for the development of the advanced smart packaging global value chain. In this regard, the partnership brings together clusters involved with the final product (packaging), the application market (food), cross-cutting technology clusters (nanotechnologies, microelectronics, software, telecommunications and plasma technologies) and new materials (plastics, polymers and biopolymers). The partnership clusters aim to cooperate in order to implement their internationalisation strategy towards defined target third countries (Canada, China and United States) and support AdPack² SME members in establishing cooperation with relevant counterparts in the target countries. The IoT4Industry project seeks to support EU growth and competitiveness through the development of a new cross-sectoral industrial value chain based on the integration and use of Internet of Things (IoT) and related components (Digital Security, Cloud Computing, Big Data, Artificial Intelligence, Communication networks, sensors, chips, electronics component, etc.) into manufacturing tools, machines and robots, industrial processes, factories environment, supply chain, intra logistics & logistics 4.0, product life cycle, smart packaging, etc. through the cross-border collaboration between SMEs and other RDI actors of the ICT and advanced manufacturing sectors. It connects 3 Information and Communication Technologies clusters having strong competences in IoT with 4 Advanced Manufacturing clusters having access to tool manufacturers and manufacturing SMEs. The project will provide support services and funding to develop collaborative projects. The services will include matchmaking and project support. In total, 3.7 million euros funding will be allocated to innovative projects through 2 calls for projects, and the support services will be provided by the consortium partners through calls for expression of interest. Cluster4Smart project proposes the main objective of expand the knowledge of Cluster Managers of Europe through the development of an innovative training resource. In addition, Cluster4Smart aims to foster the European industry and transform it to a small industry. In this way the project is in line with horizontal or sectoral priorities down below.